Cut beef into 24 one-inch pieces. Thread beef, bell pepper and mushrooms alternately on each of eight 10- to 12-inch metal skewers, leaving space between each piece. Mix remaining ingredients. Cover and grill kabobs 4 to 6 inches from medium heat 15 to 18 minutes, turning and brushing kabobs 3 or 4 times with oil mixture, until beef is desired doneness and vegetables are tender. If you prefer chicken, use boneless, skinless chicken breasts or chicken thighs, cut into 1-inch pieces, for the steak. Grill until no longer pink in center. 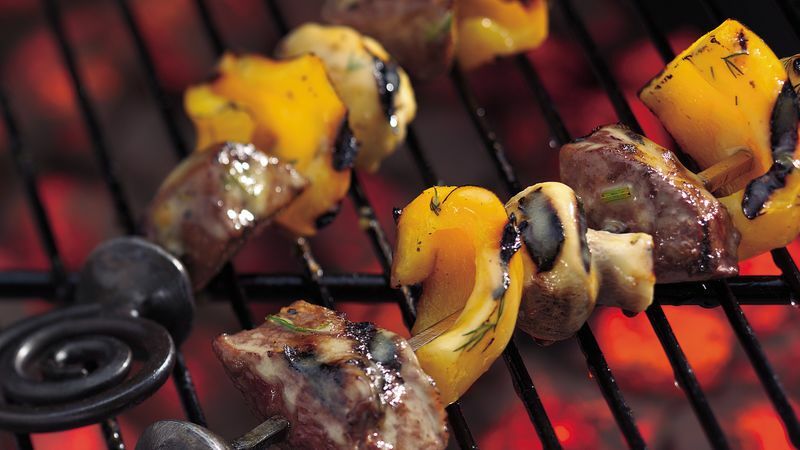 Leaving about a 1/4-inch space between pieces of food on the skewers allows for even cooking.